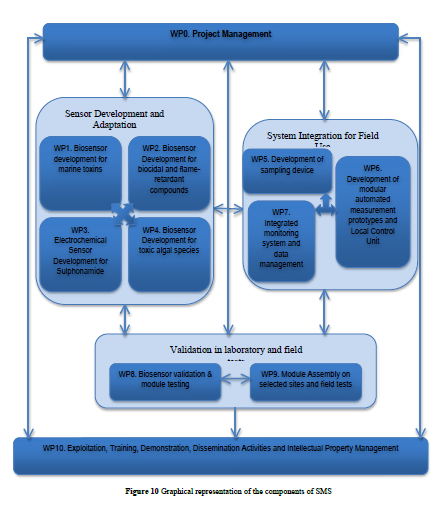 The overall work plan is built around the development of multiple modules for real-time sampling and analysis containing the appropriate sensing platforms as well as the main box that will host the modules and wireless transmission components, electronics, data storage elements, a user interface, and a power unit. The workflow will be structured in such a way as to advance the scientific front, in line with MSFD, in biosensor-assisted, real-time sampling and analysis of marine waters for a series of WFD and MSFD harmful analytes, including algal species and toxins, biocidal compounds in antifouling paints and flame-retardants, as well as pharmaceuticals. All work will culminate in showcasing the project’s three demonstration sites that were chosen to offer diversity regarding the anthropogenic impact they have sustained and the contaminant concentration they exhibit: one in La Spezia, Italy, the second in the Slovenian Adriatic Sea and the third in the protected area of the Alonissos marine park in Greece. All partners were chosen carefully to support the development of new biosensor technologies achieving realtime detection and monitoring of high-risk, presently difficult-to-measure pollutants and will demonstrate in three pilot cases proving that ICT, biotechnology and nanotechnology can increase the potential of new biosensors for marine applications. The technology development and the test cases are at the core of this effort, bringing together a multi-disciplinary and multi-sectorial team of experts exchanging knowledge with end users and relevant marine water stakeholders. The first blockdeals with sensor development and adaptation for field use and includes work packages 1 through 4, with each work package developing independently a different type of biosensor, targeted for a different pollutant group. Thus, work package 1 focuses on the development of optical aptasensors for four marine algal toxins that are found in seawater in concentration levels of ng/l and accumulate in seafood, presenting serious threat to human health, as they can easily enter the food chain: saxitoxin, palitoxin and okadaic and domoic acids. Work package 2 focuses on the development of a biocide detection microfluidic platform using nanotechnology principles to detect the relevant-to-marine-transport chemical tributyltin, used as a biocidal compound in antifouling ship paints. Using the same techniques, it develops platforms for the herbicide diuron and the flame retardant pentabromodiphenyl ether (pentaBDE). Work package 3 focuses on the development of an electrochemical sensor for the pharmaceutical product sulphonamide—one of the most frequently described antibiotic—found in human and animal excretion and ending up in treated municipal wastewater discharged to the sea. Finally, work package 4 focuses on expanding the existing capability of the ALGADEC apparatus to detect toxic algal species in order to include more species and to miniaturize and field-test the biosensor. Traditional water quality parameters, such as temperature, pH, conductivity, Dissolved Oxygen (D.O.) and nutrients will also be measured. The second building block of this work plan is “system integration for field use” and includes 3 work packages each focusing on the development of units and prototypes that will achieve the electronic engineering integration of all different modules developed in the first block together with a sampling device that will automatically collect, filter and pre-concentrate samples preparing them for in-situ analysis. Real-time data collection will be realized through a wireless transmission system that will include a low-cost embedded device with processing and communication capabilities that will enable communication with the Central Node over the Internet. Data will be processed and screened and relevant alarms will be issued to the authorities, interested stakeholders and end users for any concentrations observed above regulated limits. The third building block will concentrate on validation in laboratory and field tests. In this important step, the modules built will be validated for successful functioning in the laboratory and will then be mounted on a buoy or a platform and will be deployed in the three demonstration sites of SMS. At all times, project management will interact with all partners involved ensuring seamless collaborations and on-time reporting to the EU, whereas exploitation, training, dissemination activities and intellectual property management will be successfully conducted as milestones of SMS are achieved and deliverables are delivered.